Changing weather means changing wardrobes. As your clothing needs variation from season to season, it can be helpful to reorganize your closet every so often (every six months is good). Having a dedicated system for your winter and summer closets will improve your organization and available space. 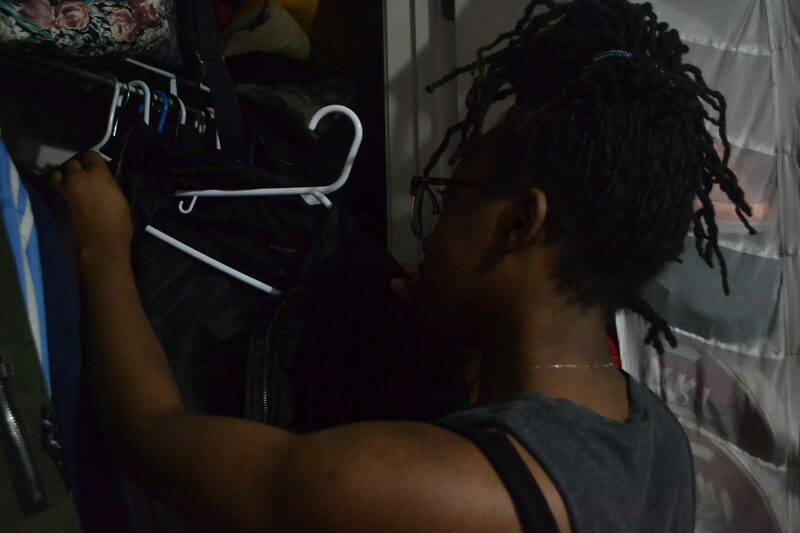 Organizing your closet should be a careful process. Each season is a chance to till the mulch of your fashion garden by moving clothes in and out of storage and donating what you don’t wear. First thing: get rid of stuff you don’t wear. Though this is not the primary function of your reorganizing mission, it is a good opportunity to do something you really should be doing anyway. It is important to go through your closet every so often and sort out what is stained, torn or plain uncomfortable. You should then sort out the seasonal items. Get out your wintry scarves, heavy sweaters, coats and boots. Sweaters can be hung when they’re being worn, but hanging year-round will stretch and damage the fabric. Scarves can be hung from shower curtain hooks or folded in a basket. Sort away the summer clothes like tank tops and shorts. You probably won’t need your sundresses or rompers for the next few months either. Remember that not all items are seasonal. Keep T-shirts, camis and anything else you can layer with. A good collection should include items which are valuable across each season, “the basics” we rely on in most conditions. After this process, you will appreciate the clothes that remain that much more. Some clothes don’t get worn as often as you previously thought and some are frivolous mistakes. If you have only worn something twice and feel like it is taking space from more deserving items in your collection, donate it. Goodwill will take (almost) everything. If the clothes aren’t too bad, you can exchange them at clothing exchanges like Rag-O-Rama, Buffalo Exchange and Plato’s Closet. They exchange donated clothes for store credit in a convenient and affordable way to change up your wardrobe. The danger here is exchanging off-season clothes; they’ll be less likely to accept the items for fear it would sit on shelves. Try not to throw clothes away if you can help it. While sorting, if you find an item you only wear a few times a year, but are excited at each wear, you may decide it’s earned its spot and can stay. A nice coat, fancy dress, skimpy top or business suit are good things to have when you need them, if not every day. These items make dressing fun. Only keep the best, and learn to identify inferior products. This skill often doesn’t require special training, though knowledge of clothes can help. What is necessary is an intuitive sense of how you use each item. T-shirts should be soft, dress shirts should be smooth and sweaters warm. If it doesn’t live up then why is it there? A good place to start examining clothes is at the seams, where items receive the most stress. Check for rips or stray threads and mend them if you can. Check that all buttons are attached and secure and that pockets are without holes. Old coats are especially vulnerable to tattered pockets as the lining fabric is more delicate. Once you have seperated what you will keep, you can move on to storing the rest. While you’re sorting and purging clothes, think about storing out-of-season clothing away. Doing this will help you find clothes faster while getting dressed. It also will prevent overstuffing, which can lead to deep wrinkles and moisture buildup. Well planned storage avoids damage to clothes from wrinkles, moisture, mold and mildew. Good storage allows for the moderate airflow that your clothes need. You have a lot of storage options available. Many people love the plastic storage boxes, which pack clothes conveniently under the bed or in an attic. For a more sustainable option, you can use canvas bags. Burlap coffee bags are a beautiful rustic choice your friends will roll their eyes at. There are also vacuum bags, if you’re into the hassle. Don’t store clothes in garbage bags or cardboard boxes, as both will cause the collection of moisture, which could cause mold. If you’re feeling adventurous, antique suitcases work just as well as plastic boxes, and they’re prettier. Fill and stack a couple next to your bed for an impromptu practical nightstand or coffee table. This should go without saying, but wash and dry your clothes before storing them. You don’t want any remaining water left in storage for months ruining your favorite shorts. There are many ways to manage the moisture of a storage space. DampRid is a popular commercial solution, which is a bucket of pellets that collect moisture. Set it on a shelf in your closet and remember to empty it of collected water and refill the pellets every so often. You can make your own moisture control by filling a delicates bag with activated carbon, which can be purchased at any pet store. Place the bag in your storage container and empty and refill it once or twice a year. Natural solutions exist for repelling bugs from clothing storage. Muslin bags filled with herbs, usually lavender, are a popular country pest repellent in the more rural areas of Europe. Balls or blocks of cedar wood are used to similar effect in the American South. Both release essential oils that clothing pests like moths avoid. These domestic tips will help you to transition through the seasons with good housekeeping. Seasons change, and Earth’s spring/summer ready-to-wear turns to an autumn’s haute couture, fall/winter 2018. While you’re going through your closet, don’t get caught without these cold weather necessities. Rain shoes: They don’t have to be Hunter boots but make sure you have something waterproof. Combat boots are a great choice, but the Nike Lunar Force 1 Duckboot is a strong casual option. Gloves: Talk about better to have it and not need it, because needing gloves and not having them can hurt. Look for the kind with touch screen compatibility, and try them on in the store. Heavy coat: For when you’ve layered all you can, the heavy coat is your last defense against the biting wind and freezing air. Classic overcoats are always cool, and puffer coats get more trendy each year.